With rugged steel construction and ample external storage for your tools and equipment, the Standard Service Body from Knapheide is a key component in optimizing your day to day productivity. 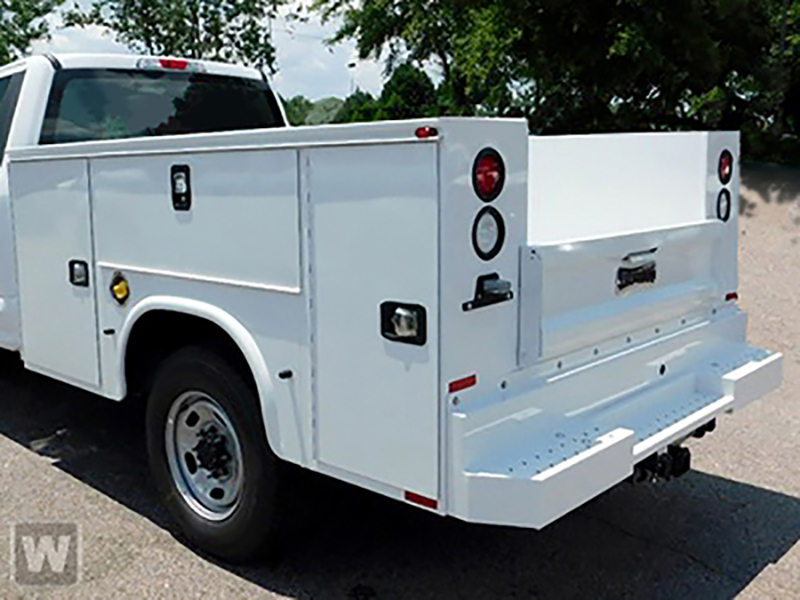 Multiple external compartments offer protection from the outside elements and allow technicians to access equipment without having to climb into the truck bed. Staying organized both on and between job sites is important, that's why Knapheide's Standard Service Bodies compartments come standard with adjustable shelving and can be customized with a variety of storage options. Our double panel door construction combined with stainless steel rotary latches keeps your equipment and tools secure and safe. And, to provide peace of mind, Knapheide's Standard Service Bodies are fully tested and are supported with a six-year warranty. Vehicle available in 3 days if acquired through dealer trade OR up to 8 weeks if ordered through manufacturer. Disclaimer: Although every reasonable effort has been made to ensure the accuracy of the information contained on this site, absolute accuracy cannot be guaranteed. This site, and all information and materials appearing on it, are presented to the user "as is" without warranty of any kind, either express or implied. All vehicles are subject to prior sale. Price does not include applicable tax, title, license, processing and/or documentation fees, and destination charges. ‡Vehicles shown at different locations are not currently in our inventory (Not in Stock) but can be made available to you at our location within a reasonable date from the time of your request, not to exceed one week. In order to keep track of your saved trucks, we just need a few things: your email address, first name, last name, phone number, and zip code.